Two years ago, I wrote about my personal connection to a Mammoth discovery in Channel Islands National Park. I've mentioned that I worked as a Park Naturalist (the type of Ranger most visitors see) at Channel Islands National Park during the summer of 1986 three times on this blog, most recently in Happy 100th birthday, National Park Service! I've also mentioned that I'm a paleontologist...I took advantage of my paleontological expertise that summer at Channel Island by giving an evening program on Pygmy Mammoths, so this subject is near and dear to my heart. 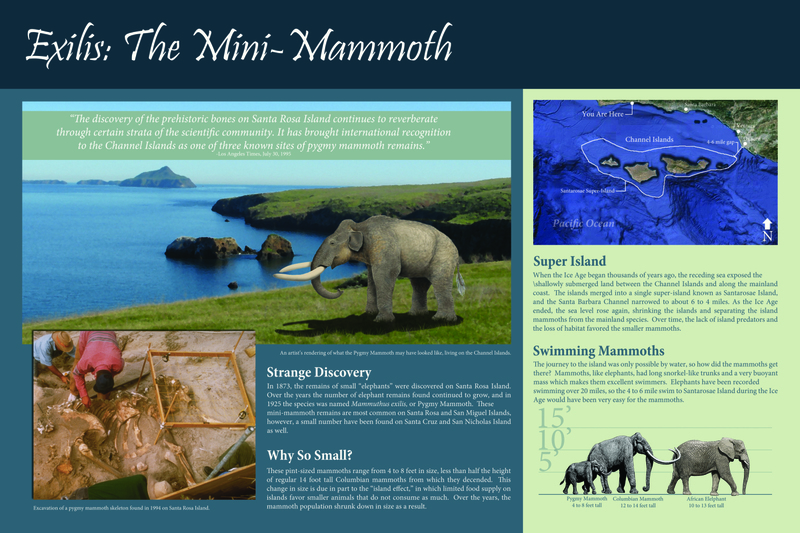 Yesterday, PBS Eons examined the topic of Pygmy Mammoths and insular dwarfism in The Island of Shrinking Mammoths. The mammoths fossils found on the Channel Islands off the coast of southern California are much smaller than their relatives found on the mainland. They were so small that they came to be seen as their own species. How did they get there? And why were they so small? I covered many of the points of this video in my talks 33 years ago, including the ancestors of the mammoths swimming out to the islands, the islands becoming a single large island closer to the mainland during glaciations, and the likely reason for the mammoths shrinking. I'm glad those ideas have stood the test of time, so the visitors who listened to my talks are still well-informed, if they remember them. I also expected that some new information would have come to light during the past three decades and the video shows that it did. In particular, the possibility that smaller mammoths could be able to climb steeper slopes than their full-size relatives to eat a different diet and the length of time mammoths lived on the islands were both things I didn't know before watching this video. I'll finish by updating what I wrote about the PBS NewsHour video in the previous entry about Pygmy Mammoths: "Thank you PBS [Eons} for reminding me of those days and updating me and the rest of their viewers on the latest on Pygmy Mammoths."